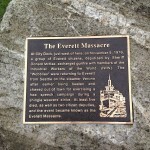 After my talk in Everett yesterday, I revisited the site of the Everett Massacre, a confrontation on the waterfront that led to at least seven deaths one hundred years ago. When I wrote Walking Washington’s History: Ten Cities, there was nothing marking the site on Port Gardner Bay, but an audience member told me there was now a plaque. Sure enough a plaque sits at the western foot of Hewitt Ave. where a brick spur ends at the railroad tracks. This isn’t the exact spot where shots rang out on the City Dock, November 5, 1916, but it’s close. The plaque is grounded on granite that should outlast the shifting sands of both the waterfront and historical interpretation. 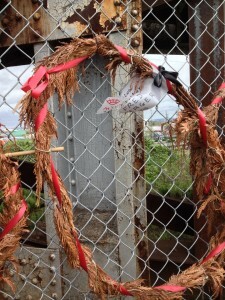 My eye was drawn beyond the rock to a more temporary and more moving memorial–eleven cedar wreaths, red ribbons intertwined, hung on a fence, each with the name of a man killed or missing in the worst labor-management conflict in Washington history. Members of the Industrial Workers of the World (the I.W.W. or Wobblies) had been beaten and chased back to Seattle when they tried to support a shingle-weavers strike in the mills. They returned by boat and were met at the dock by the sheriff and a force of deputized men. A shot rang out, and in the ensuing battle, at least five Wobblies died, as well as two deputized citizens. Another six or seven Wobblies went missing, never reclaiming the union cards they had left in Seattle that morning. They may have drowned after being shot or jumped into the water to escape the firing. Another 50 were wounded. 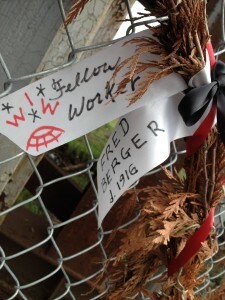 Each wreath bears the name of a “fellow worker” who died that day. They were hung by contemporary members of the I.W.W. who then completed the march the Wobblies had intended in 1916, to the Speakers Corner at Hewitt and Wetmore. 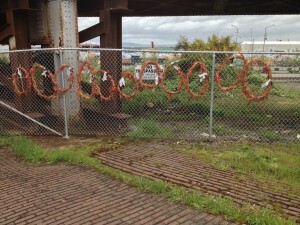 The wreaths hang on a fence with a No Trespassing sign, still drawing lines between corporate interests and public access. The Everett Herald published a detailed discussion of the clash near its 100th anniversary.